As Apprising Ministries monitors the Net and social media one of the trends I’m seeing is postmodernism’s effects slithering more deeply into the professing Christian community. Combined with the sappy sentimentality spread by practice of Contemplative Spirituality/Mysticism people are now deciding issues by their feelings. My point being, it simply doesn’t matter one iota how we may feel about a given subject; it’s truth or falsehood is based upon factuality, not feelings. A case in point right now is Oprah Winfrey. Once again people are becoming convinced that the media mogul is a Christian. As a matter of fact, Winfrey even makes that claim herself. You can also see Winfrey’s tolerant statement, “I respect for all faiths” was a real crowd pleaser. Of course we respect people of other faiths but with such as those as Oprah Winfrey those religions are actually irrelevant because, in their warped and toxic perceptions, the New Spirituality they espouse transcends these faiths. What’s imperative in this tolerant time in which we live is to make people define their terms. If we hope to understand Winfrey’s claim we simply can’t let her go off-roading mentally into the mud of the postmodern Wonderland of Humpty Dumpty language where the meanings of words descend into its muck and mire. So now, from her own—pardon the pun—words we’ll let Winfrey testify as to what she means by Christian. When we do you’ll clearly see she’s not a Christian despite her claim to the contrary. The following clips come from A New Earth Online Class which Winfrey did with Eckhart Tolle, a leading guru of the New Spirituality. This was Winfrey’s first stab at webcasting while the two promoted the mythology in Tolle’s book A New Earth: Awakening to Your Life’s Purpose (ANE). Following is Winfrey’s “Christian” testimony from her own lips; and keep in mind this is taken directly from the transcript of the online class, produced by Winfrey herself. I want you to know that I purposely left the commercials in this opening clip to give you a better idea just how dangerous Oprah Winfrey really is. As you’ll see, she literally reaches, and impacts, millions of people around the entire world with her deadly spirituality; and with some heavyweight sponsors as well. OPRAH WINFREY (HOST): A worldwide Web event. ANNOUNCER: Brought to you by Chevy; technologies that go from gas-friendly to gas-free. Sponsored in part by Post-it Flags; find out what matter—fast. Sponsored in part by Skype; bringing people closer with video calling. OPRAH WINFREY (HOST): Welcome to our very first live worldwide interactive event. We are here tonight breaking new ground. Nothing like this has ever been attempted before. Right now, you all are online with me from every corner on our planet. Places like Albania, Bolivia, Cambodia, Ecuador, Finland, Hong Kong, China, India, Zimbabwe, Australia, Canada, the UK and the rest of Europe. Along with, of course, all 50 states here in our United States of America. Over 139 countries are represented in our class tonight. Welcome to you all. And I, intellectually, I couldn’t have answered, “Why am I writing another book?” And it happened. OPRAH WINFREY (HOST): And it happened. Were you asking life, universal energy? I don’t know. What do you call that? As a word do you—I call it “God.” What do you, what word do you use for that? Again, this impersonal, unknowable, “consciousness” is a repudiation of the Christian position concerning the nature of the one true and living God of the Bible Who is Personal and known through Jesus Christ. If Oprah Winfrey was a Christian she would just not be endorsing and promoting this New Spirituality of Eckhart Tolle. KELLY (ILLINOIS): Well, my question is regarding religion and spirituality. OPRAH WINFREY (HOST): Big one. KELLY (ILLINOIS): I had a Catholic upbringing, I married a Catholic, and we’re raising our children this way. In reading books such as Tolle’s, I’ve really, it’s really opened my eyes up to a new way of thinking: a new form of spirituality that doesn’t always align with the teachings of Christianity. 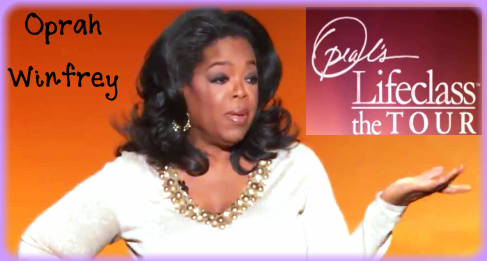 So my question is to you, Oprah, how have you reconciled these spiritual teachings with your Christian beliefs? OPRAH WINFREY (HOST): Oh, the question’s to me. I was resting knowing it was going to about—I’ve reconciled it because I was able to open my mind about the absolute indescribable hugeness of that which we call “God.” I took God out of the box because I grew up in the Baptist church and there were, you know, rules and, you know, belief systems in doctrine. And I happened to be sitting in church in my late 20s, and I was going to this church where you had to get there at 8 in the morning or you couldn’t get a seat. And a very charismatic minister, and everybody was just, you know, into the sermon. And this great minister was preaching about how great God was and how omniscient and omnipresent, and God is everything. Now I think that’s very eloquently put by Eckhart Tolle in Chapter 1. But that is exactly what I was feeling when I was, you know, sitting in church that Sunday listening to the preacher. And you know, it’s been a journey to get to the place where I understand, as I said on the preshow here, that what I believe is that Jesus came to show us Christ consciousness. This is classic New Age mythology aka the New Spirituality and actually couldn’t be further from a Christian testimony. Jesus didn’t come to show us some laws “to know that way.” No, Jesus is the way to the Father; and He didn’t come “to show us Christ consciousness because the Bible tells us God the Son is the Christ. OPRAH WINFREY (HOST): And how do you advise people to reconcile this with their religious beliefs? ECKHART TOLLE (AUTHOR A NEW EARTH: AWAKENING TO YOUR LIFE’S PURPOSE): Well, religion can be an open doorway into spirituality, and religion can be a closed door. It prevents you from going deeper. So that I love reading the New Testament, and I also read the Old Testament. Sometimes there’s some incredible jewels in there. And when I went through this inner transformation, and for the first time accidentally I picked up a copy of the New Testament at my mother’s place. And I started reading, and I immediately recognized the deep truths that is there, and I realized the truth that is deeper, that is expressed in what Jesus said, is much deeper than what you, how the church interprets it. There’s a depth to it. And it reflects your own depth when you read it. So there’s no conflict between this teaching, which is purely spiritual, and any religion. Because if you go deep enough in your religion, then you all get to the same place. It’s a question of going deeper, so there’s no conflict here. The important thing is that religion doesn’t become an ideology—so, “I believe this.” And the moment you say “only my belief” or “our belief” is true, and you deny other people’s beliefs, then you’ve adopted an ideology. And then religion becomes a closed door. But, potentially, religion can also be an open door. OPRAH WINFREY (HOST): Well, let me share this with you too, Kelly. There’s another book by a woman named Elizabeth Lesser, it’s called The Seeker’s Guide, where she talks about the new spirituality versus the old. So I just wanted to—this is on page 51 and 52 of Elizabeth Lesser’s book called The Seeker’s Guide. And she talks about old spirituality versus the new spirituality, and she says the old was—the old way is—the hierarchy has the authority. Church authorities tell you how to worship in church and how to behave outside of church. The new spirituality is that you are your own best authority as you work to know and love yourself, you discover how to live a more spiritual life. The old is, “God and the path to worship him have already been defined, and all you need to do is follow the directions.” The new is being able to listen within for your own definition of spirituality, your deeper longings are under search. And the old says exact here what Eckhart was saying. That there’s only one path. It’s the right way and all other ways are wrong. And the spirituality says that many paths lead to spiritual freedom and peace. You have a rich array of gems from which to draw illumination. The world’s religious traditional, mythology, psychology, healing methods, scientific wisdom, your own experience and that you can begin to string a necklace all your own. Then she lists, you know, other old and new. And so it’s really a question of what you were saying to us earlier that this material strikes a chord within you. Something in you opens up and wants, you know, feels alive and is awakened to that. And yet there is the ideology that says what to you? What is the conflict for you?